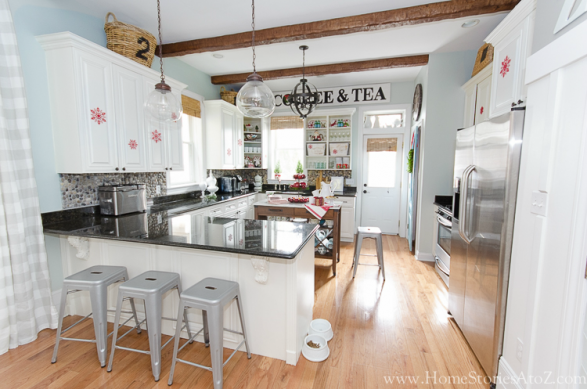 Welcome to my Christmas kitchen tour! I’ve really enjoyed spreading out my Christmas house tour this year. 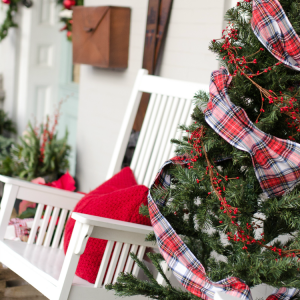 I usually participate in a full-home Christmas tour with other bloggers and have to scramble to get the entire house ready to photograph in late November. 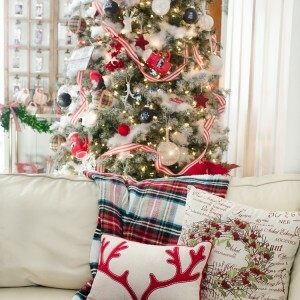 It’s honestly exhausting and draining to do so—and takes a lot of the fun out of Christmas decorating for me. And honestly, as an avid blog-reader, I find full-home Christmas posts a bit too long to sit through. It’s a lot of pictures to cram into one post! 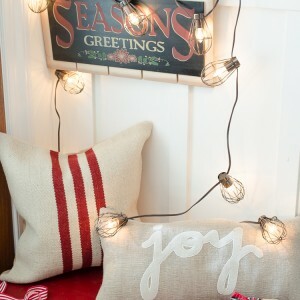 Slow decorating–at my own pace–is so much more enjoyable and I think it shows this year! 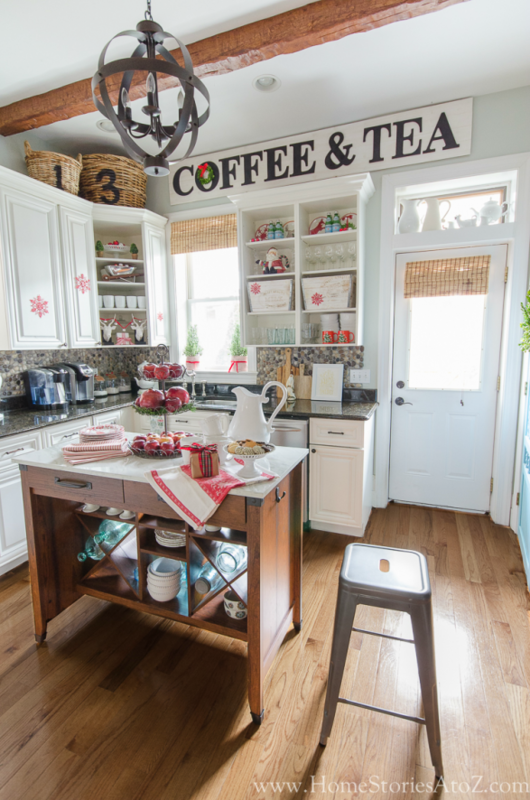 On Friday, I made sure the kitchen was Christmas-ready for my annual “Ladies Spa Night”. This tradition has been taking place at my home for the last 8 years. It’s just a time where a bunch of moms get together, eat yummy food, drink wine, and do our nails. We bring all of those items you receive for Christmas but rarely use–paraffin wax machines, exfoliants, foot baths, lotions, and potions–and we give ourselves mani-pedis. It’s such a fun time of bonding and laughter, and we all look forward to it every year! 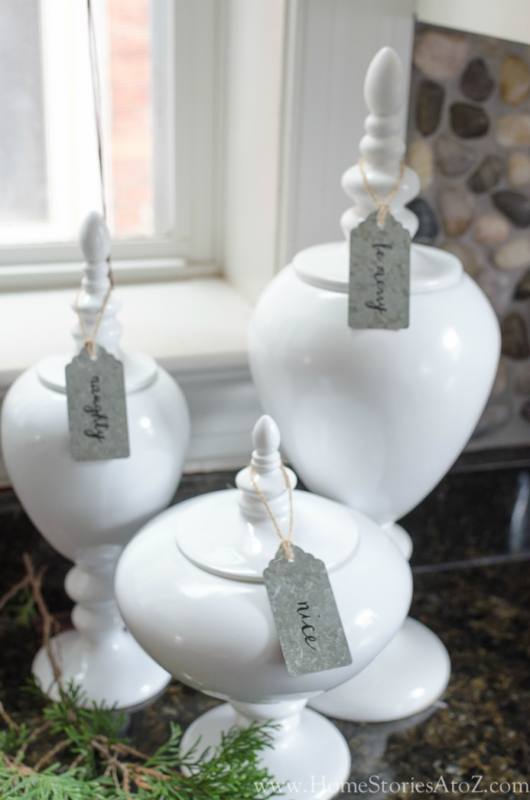 To dress up my kitchen bins and containers, I used inexpensive Target gift-tags. What would we have done this year without the dollar spot?! 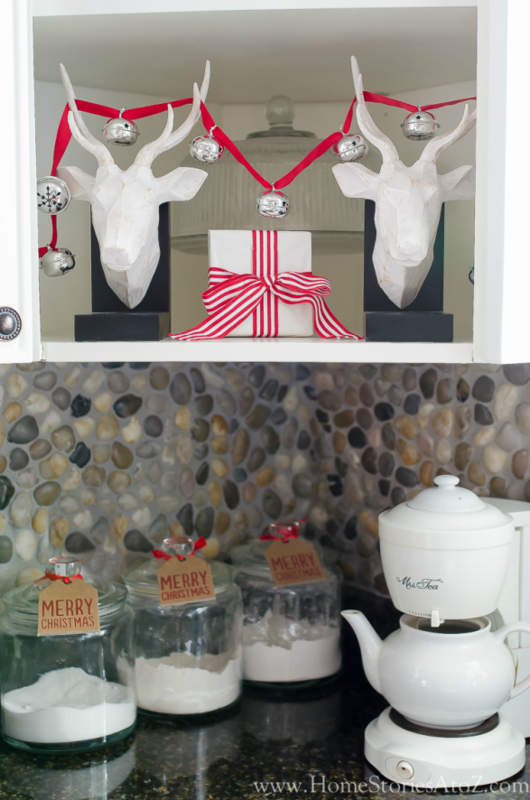 😀 Dollar store bells on a red grosgrain ribbon adorn my deer-head bookends and add a festive touch to the corner cabinet. I always enjoy decorating my open shelves for the holidays. The Santa teapot was a piece I grew up with. 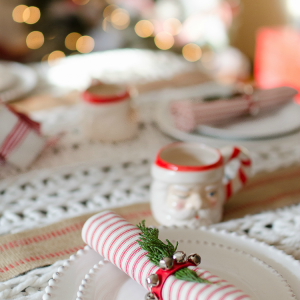 We always served warmed milk in it for our Christmas morning French Hot Chocolate. It’s a fun tradition that I now share with my boys. 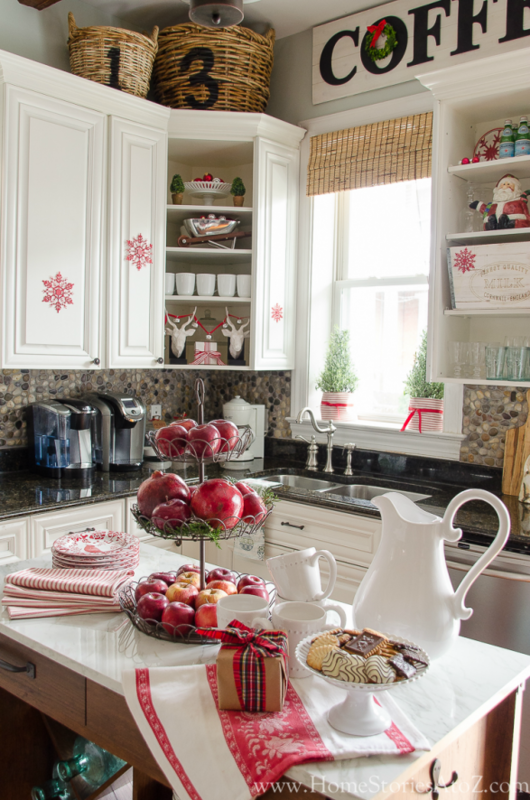 Inspired by a Christmas kitchen pic from my Pinterest files, I used dollar-store snowflakes on all of the cabinets. They were originally clear and sparkly. I gave them a quick coat of red spray paint and adhered them to the cabinets with Command Strips. 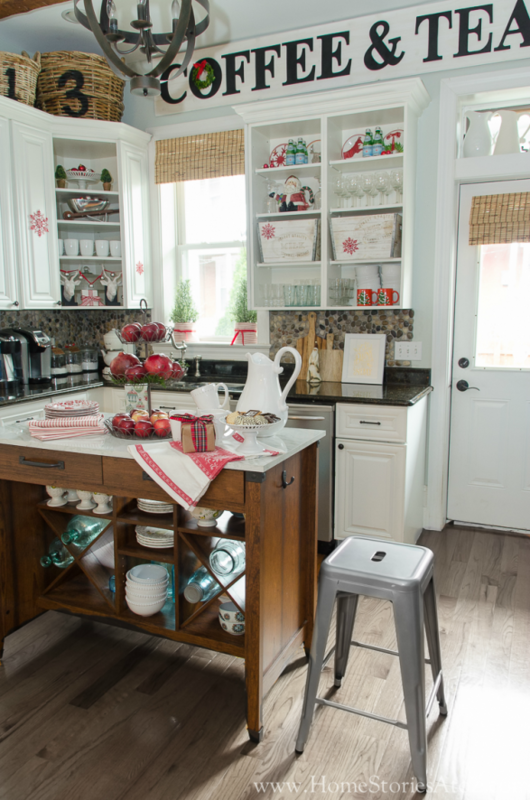 Capturing my full-kitchen on camera is a challenge! This isn’t the best picture but it gives you some perspective on the space. I’m often asked where my stove is since it’s on the less-photographed wall. It’s tucked in next to the refrigerator. Zephan was anxious to sneak a cookie after my shoot was complete! Eowyn and Pippin were hopeful they would get a treat too. Last year at this time Zephan was still in a wheelchair from multiple broken bones. Zeph suffers from unexplained severe juvenile osteoporosis. Even after genetic testing and myriads of blood tests, we don’t know what is causing it and we weren’t sure he would be able to walk again without an assistive device. I cannot tell you how happy it makes my momma-heart to see my baby moving with ease this year! It is beyond my wildest Christmas dreams to see him doing so well! His disease is still present and there are not great treatment options available–but praise God that he is walking, dancing, doing Kung fu, and sitting in a chair sneaking cookies! 🙂 If you’ve prayed for us over this last year or helped with our horrendous medical bills, thank you. I get emotional every single time I talk about it, but I cannot thank you all enough for supporting us this past year. It was one of the most difficult years of my life. BUT we are stronger and closer as a family because of it! 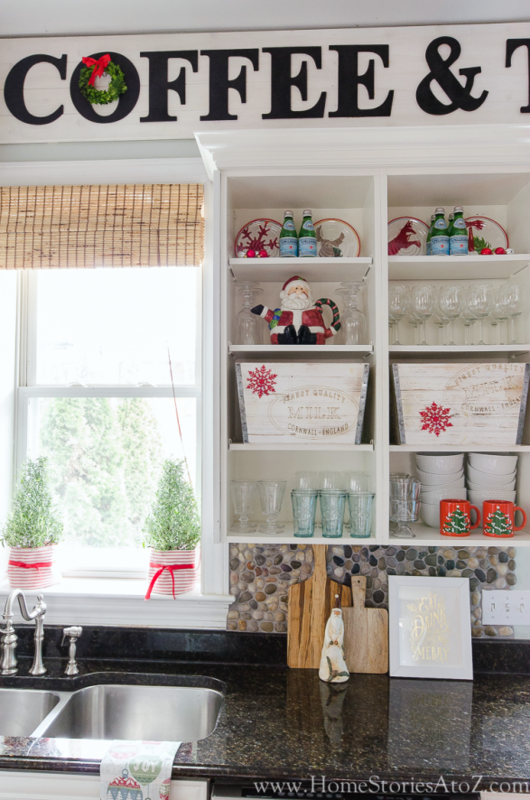 Thanks for stopping by to tour my Christmas kitchen! 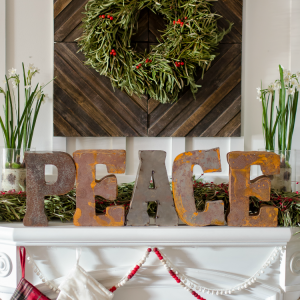 If you liked this post, you might enjoy the related posts below to see the rest of my Christmas home this year. Great decor and cute dogs! What a beautiful post !! It certainly reflects the grace and beauty of God’s work in your lives. So great to hear about Zeph! Thanks for sharing! I’m still praying you will find answers. Blessings to your family this Christmas! Such a bright & cheery space!! 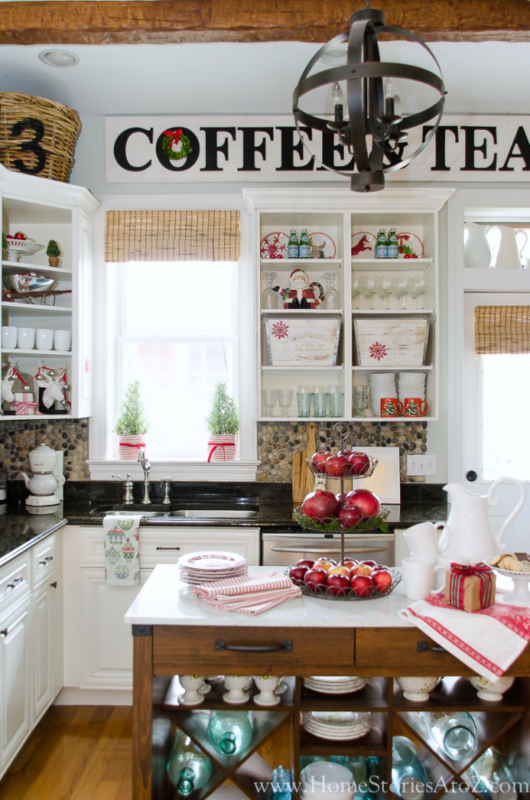 I love the coffee & tea sign ,and your styled island with the goodies mmm yummy & so fresh!! Happy Monday!! Gorgeous, My favorite pic is the the one of your son and such a miracle that he is moving easily. The best Christmas Blessings ever. Thank you so much Marty! Merry Christmas!